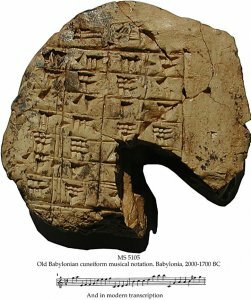 Description	 MS in Old Babylonian on clay, probably Larsa Babylonia, 2000-1700 BC, 1 lenticular tablet, diam. 9,0x3,2 cm, 2 double columns, each of 7 ruled lines with numbers in Old Babylonian cuneiform tablature notation, with headings, "intonation" and "incantation", respectively. Context	 The only other complete music text is a later Hurrian hymn written in the mode of nidqibli, which is the enneatonic descending scale of E.
Commentary	 The oldest musical notation known so far. Lutes are not preserved from the Old Babylonian period. The earliest known description of a lute dates from the middle of the 10th c., of a 9th c. instrument, Oxford, Bodleian library MS Marsh 521. The present notation system gives contemporary information on the Old Babylonian 4 stringed lute. It further attests that frets were used, and that their values, tonal and semitonal, were purposely calculated. Most significantly, the discovery of this text attests of a music syllabus in educational institutions about 4000 years ago. Published	 To be published by Richard Dunnbrill: An Old Babylonian music text, from where the information has been taken.